Jason Steadman is a thirty-year-old sales executive living in Boston and working for an electronics giant, a competitor to Sony and Panasonic. He’s a witty, charismatic guy who’s well liked, but lacks the “killer instinct” necessary to move up the corporate ladder. To the chagrin of his ambitious wife, it looks as if his career has hit a ceiling. Jason’s been sidelined. All that will change one evening when Jason meets Kurt Semko, a former Special Forces officer just back from Iraq. Looking for a decent pitcher for the company softball team, Jason gets Kurt, who was once drafted by the majors, a job in Corporate Security. Soon, good things start to happen for Jason – and bad things start to happen to Jason’s rivals. His career suddenly takes off. He’s an overnight success. When Jason tries to put a stop to it, he finds that his new best friend has become the most dangerous enemy imaginable – and far more than his career hangs in the balance. 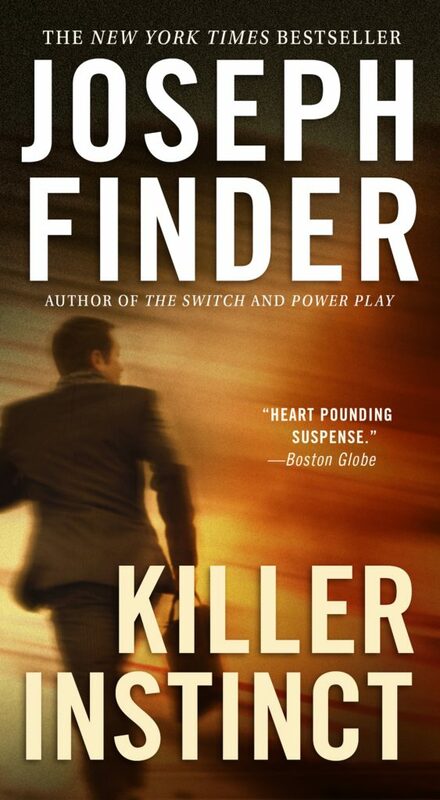 A riveting tale of ambition, intrigue, and the price of success, KILLER INSTINCT is Joseph Finder at his best. "The master of a complex suspense formula... has scenes of flawlessly executed violence, crisp dialogue and taut pacing. His sendup of the 'Business is war' mentality is acute and good-humored." "Mr. Finder's fictional portraits of life in the maw of the private sector are sharper than those of most writers who moonlight on this terrain… Mr. Finder's premise, of imagining overcaffeinated executives like Jason Steadman storming the corner office as if it were Fallujah, is rich territory." "Where's the disclaimer saying that any libelous resemblance of characters in this book to real people or companies is purely coincidental? …Finder is a well-versed tour guide to the business world, capable of mixing satire with insider lore. Finder's take on the sales rep's trade is as cynical as that portrayed in the movie Tin Men or in the David Mamet play Glengarry Glen Ross." "With his third novel in as many years to deal with a similar theme, Joseph Finder has firmly established himself as the master... doing for the country's boardrooms and executive suites what John Grisham did for its courtrooms... KILLER INSTINCT is a superb story that dazzles with its heart-pounding suspense, even while posing deeper questions about the ethics of business and what we're willing to do to get ahead." We didn’t like each other very much, but we were good at reading each other, the way a couple of wolves size each other up in a few seconds. There was nothing outwardly competitive about the way I asked, but he got what I was really asking: Did you land the deal? You going to be my boss now?